Have you ever been so hungry that you’ve lost all sense of orientation? As someone whose sense of direction isn’t great even at the best of times, I can tell you that it’s a rather dangerous position to be in. The combined effects of hypoglycaemia and an inherent lack of navigational instinct can only lead you further away from your destination, and if you’re not careful, you could end up walking into an argument with a bus – and losing. Usually, I enter this state of hunger-induced delirium whenever Steak forces me to go shopping, but when we decided to visit Tang – a small noodle bar tucked away in Fitzrovia, I found myself feeling lost and confused before we had even stepped onto Oxford Street. Clearly, my brain had sensed the imminent danger of retail-hell, and shut itself down in a bid to protect itself. This alone would not have been a problem, but when my Google-Maps app decided to join the rebellion, we ended up walking straight past Tang’s inconspicuous entrance (just next to VQ Bloomsbury) not just once – but twice. In the end, we managed to get to grips with the intricate skill of finding a door, and strolled in to enjoy what would hopefully be a light, but hearty Asian meal. Note: The chicken and the beef dishes are certified halal. Pork and alcohol are served on the premises. Inspired by the cosy and claustrophobic noodle bars of the Far-East, Tang hosts a rustic street food menu that is available as a quick sit-in lunch, or a simple, light dinner. Whilst hot broths of “tang” make up the bulk of this menu, we decided to go the other way, and ordered a couple of steamed bao buns and a bowl of “beef and rice” instead. First up, was the fried chicken bun, which boasted a small but chunky piece of fried chicken topped with pickled bok choi and a housemade hot sauce. The crunchy bok choi served as the perfect textural partner for the crispy, yet tender chicken, and together with the sharp and spicy kick of the hot sauce, it was nothing short of a delightful first bite. As someone who lives and breathes for beef, I was certain that the short rib beef bun would immediately steal our affections away from the chicken. However, whilst the beef itself was soft and tender, the black vinegar reduction simply failed to come through, resulting in a relatively flat set of flavours. It must also be said that both buns possessed a rather stodgy and doughy texture, which was rather far removed from the soft and sticky texture that we were expecting. Thankfully however, the flaws ended there, as the bowl of “beef and rice” was perfect in every aspect. The soft, moist, and aromatic jasmine rice meshed in with the black vinegar reduction, providing a flavoursome base for the succulent short rib beef. Once again, the beef simply fell apart, and the soft and creamy fat that was attached to it melted away in the mouth. The beef also possessed a light glaze that added a very subtle sweetness to the rice, and together with the musky essence of the bok choi, this resulted in a wonderfully balanced and layered dish. 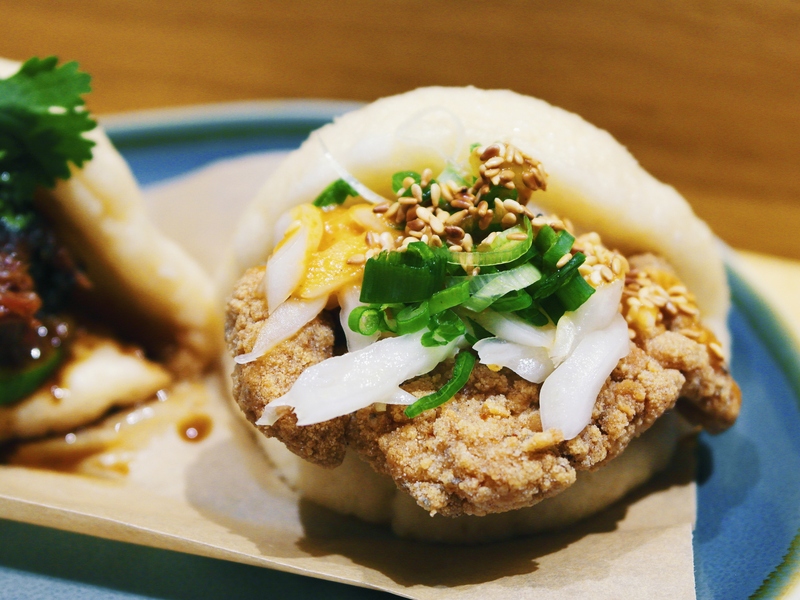 Across the menu, small dishes, (including the bao buns) cost around £4 to £5, whilst big dishes cost around £10. For a small eatery in central London, this is fairly reasonable, and the quality of the food is, for the most part, befitting of the bill that comes with it. If you’re after a particularly big meal however, you may find more cost-effective methods of filling your stomach elsewhere. Tang will not be beaten however when it comes to hospitality, as the staff members are almost as endearing as the food that they serve – (albeit, not as edible). Not only were they courteous, helpful and efficient in serving up some good grub, but they managed to do it all without once breaking away from the warm and welcoming smiles plastered across their faces. As Steak will no doubt testify, anyone who can manage to smile at my face for such a prolonged period of time deserves an award for their charitable contribution – and probably a free eye test too. Luckily for you, Tang’s own appearance is a little more bearable. Granted, there is not a single window in sight, and the dining space is probably no bigger than most living rooms, but this all helps to recreate the rustic feel of a dim and dingy streetfood shack from the Far-East. Of course, Tang’s own “shack” is far more clean, crisp, and modern, and you can expect to find a fairly quirky decor. The walls are covered in newspapers and old photographs, and the ceiling sports a generous number of lights and small nooses – (presumably to hang your dining companion from if they get on your nerves). Tang can be found (with a bit of difficulty) a short walk away from Tottenham Court Road station, and public transport is certainly advised. Whilst Tang’s proprietor may have taken the concept of “a hidden gem” a little too literally, it’s certainly an eatery that is worth searching for. Like any new food vendor, a few tweaks are needed here and there, but for the most part, Tang offers an interesting range of light bites and hearty bowls that do justice to the culinary style they are aiming to recreate. Whether you’re after a quick lunch near Oxford Street or you just want to run away from your partner’s shopping spree, Tang provides a great space in which to eat (and hide) amongst the bustle of London’s retail heart.